Saudi Arabia is preserving pre-Islamic heritage sites, like a date palm oasis from the Stone Age, in a break with the austere strain of fundamentalism that has dominated the country for decades, as the reclusive kingdom tries to open up. Wahhabism, the ultra-conservative branch of Islam that emerged in Saudi Arabia some 250 years ago, regards the veneration of objects, especially those predating the Prophet Muhammad’s (PBUH) life in the 7th century, as tantamount to idolatry, and has advocated their neglect or outright destruction. But under reforms pushed by Crown Prince Mohammed bin Salman, who has vowed to promote a more moderate form of Islam and loosened strict social rules like a ban on women driving, the kingdom has allocated $1 billion to preserve its heritage. Many of the cultural areas date back thousands of years and the attention given to them could risk a possible backlash from religious fundamentalists. “National heritage wasn’t an easy trip, to get people to reflect and go back, especially the antiquities. All the discussions that were about antiquity this is not Islamic, this is Islamic this is I think behind us now,” said Prince Sultan bin Salman, head of the Saudi Commission for Tourism and National Heritage (SCTH). The 62-year-old royal, a son of the king and an older half-brother of the crown prince, said in a recent interview about ongoing cooperation with senior Muslim scholars including bimonthly discussions with the Grand Mufti, the kingdom’s top religious figure, about the latest “discoveries”. Those include Al-Ahsa, one of the world’s largest natural agricultural oases, which became the country’s fifth UNESCO World Heritage site last month. In addition to fresh- and hot-water springs and vast tracks of date palms, the 10,000 hectare (25,000 acre) region holds archaeological sites dating to the Neolithic period. Another UNESCO site, Madain Saleh, is a 2,000-year-old city carved into the rocks of the northern desert by the Nabateans, the pre-Islamic Arab civilisation that also built Petra in neighbouring Jordan. It is now the centre of a multi-billion dollar tourism project the authorities are developing with French support. “I believe you cannot understand Islam as a great religion if you are dismissing completely what happened before Islam,” Prince Sultan said. He said up to 150 important sites had been intentionally destroyed or lost to urban development before the government adopted its new policy of protecting pre-Islamic monuments. SCTH is dispersing soft loans to municipalities to develop heritage locations and preparing another 10 sites for UNESCO recognition. 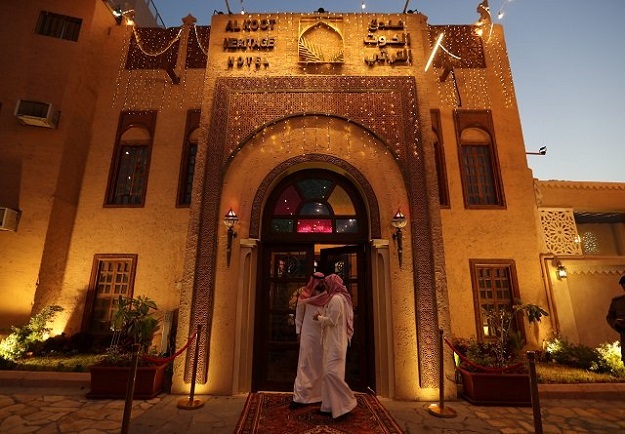 Saudi Arabia hopes reviving such sites will bolster national identity while attracting tourists – local and foreign – as part of a bid to diversify the economy of the world’s top oil exporter away from crude. Reforms aim to lift total tourism spending to $46.6 billion in 2020 from $27.9 billion in 2015. Saudi Arabia is home to more than 10 million foreign workers and family members, and grants more than 6 million special visas a year for foreigners to attend the annual Hajj and other Muslim pilgrimages. But it does not offer regular tourist visas. Plans to admit tourists have been discussed for years but have not come to fruition due to sluggish bureaucracy and concern over conservative sentiment. Prince Sultan said last year he hoped the kingdom would start issuing visas in 2018, but said that they still need approval from “the higher authorities in government”, without elaborating or setting a new timeframe. Asked if the kingdom would relax social restrictions to allow tourists to drink alcohol and wear bikinis, Prince Sultan said: “Ninety-nine percent of the things you say today are allowed in Islam and can be managed as we speak, but there are some things that will not be accepted in Saudi Arabia.